Whatever you call them - button-ups, dress shirts or fitted shirts - they are the staple of any man's professional wardrobe. You want them done right, you want them done fast, and you DON'T want to spend a small fortune every week getting your shirts cleaned and pressed. Commonwealth Cleaners hears you. We want your business and we want to earn it. That's why we offer the best deal in Easton on laundered dress shirts. Heck, it's probably the best deal in Mansfield, Norton, Bridgewater and Brocton, too. Your dress shirts will be laundered, pressed and starched to the level of stiffness you specify. 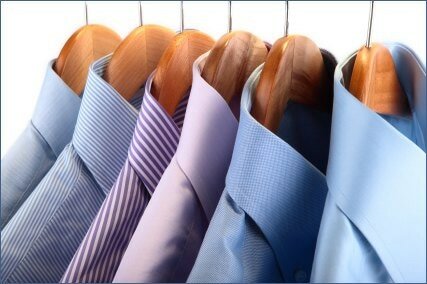 Having your dress shirts laundered is different than having other clothing items, such as a sports coat or pair of dress slacks, dry cleaned. When it comes to button-up shirts, the process is not much different than the one you'd follow at home if you were doing it yourself with a washing machine and ironing board. First, we unbutton the front, the collar and the sleeves. Next we check for stains and then spot clean any stains that washing won't remove, using professional dry clean agents and techniques. Then we wash the shirt using professional cleaning detergent and starch, getting the shirt to the level of stiffness you specify. After the shirt is cleaned, the real magic happens. Your shirt will be form pressed using state of the art pressing equipment (as seen in the image below) in our dry cleaning plant. 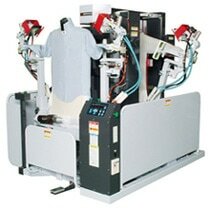 The form pressing machine is what makes each part of the shirt look so good. There is a form for the body, there are forms for each sleeve and cuff, and a form for the collar. Each part of the shirt is given targeted pressing using purpose-designed equipment. All of this is done by hand by a professional shirt presser. When you think about it, $1.99 is an incredibly low price for all the work being done to a single garment. Service. Quality. Price. When you have your laundered dress shirts done by Commonwealth Cleaners, you know you're getting the best price around, the shirts come out right, and our service is unmatched. What are you waiting for? Stop in today and give us a try. And don't forget to inquire about our VIP Membership - it's free! Offer Details: The $1.99 price is valid at drop off when 1 or more shirts are accompanied by at least 3 or more pieces of dry cleaning. The $1.99 price is valid for men's button up, cotton, laundered dress shirts. This special price offer does not apply to the following types of garments: Polo shirts, t-shirts, Tommy Bahama style shirts, "Dry Clean Only" labels, and ladies tops & blouses.